I am here on behalf of LHNCC and the community we serve and thank you for giving me this opportunity to speak on their behalf. 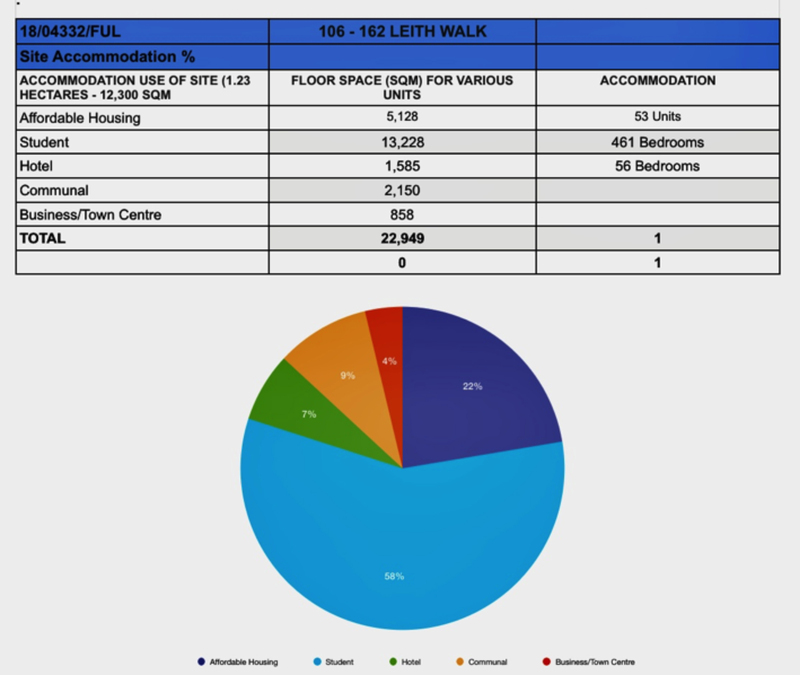 Our CC encompasses a large area that includes Great Junction Street, Newkirkgate, Foot of The Walk and West side of Leith Walk to Number 92 all within the Leith Conservation Area and contribute to the ‘Heart of Leith’. We are passionate about the history, heritage, people and the Community we represent. We work closely with, and are adjacent to, LCCC and LLCC who are also here today representing their communities. The mix, style and proportions are unique to this section of Leith Walk. Examples include The Arches in Manderston Street and the Art Deco Building that is at risk of being demolished in this Planning Application, and the majestic Columns that supported the Railway Bridge on the corner of Leith Walk and Jane Street. We have identified specific areas to support our grounds for objection relating to the above Planning Applications. The Council will seek the provision of a mix of house types and sizes where practical, to meet a range of housing needs, including those of families, older people and people with special needs, and having regard to the character of the surrounding area and its accessibility. 223 It is important to achieve a good mix of dwelling types and sizes to avoid the creation of large areas of housing with similar characteristics. This approach supports more socially diverse and inclusive communities by offering a choice of housing and a range of house types to meet the needs of different population groups, from single- person households to larger and growing families. Does not address or provide the range of housing needs, including those of families, older people, people with special needs including mobility issues. It does not identify if internal design in properties will have appropriate space and manoeuvrability facilities for the above groups. The proposal will not result in an excessive concentration of student accommodation (including that in the private rented sector) to an extent that would be detrimental to the maintenance of balanced communities or to the established character and residential amenity of the locality. This also applies to the question about whether the student accommodation will service holiday rental or short term lets outwith term times? The Council adopted new guidance for student housing in February 2016 whereby any development over 0.25 ha. in size would need to include 50% housing provision on site. Click the graphic to see the full-size version. Planning permission will be granted for development where it is demonstrated that the proposal will create or contribute towards a sense of place.Design should be based on an overall design concept that draws upon positive characteristics of the surrounding area. Planning permission will not be granted for poor quality or inappropriate design or for proposals that would be damaging to the character or appearance of the area around it, particularly where this has a special importance. Proposals for the demolition of any building within a conservation area, whether listed or not, will not normally be permitted unless a detailed planning application is approved for a replacement building which enhances or preserves the character of the area or, if acceptable, for the landscaping of the site. c) demonstrates high standards of design and utilises materials appropriate to the historic environment. The demolition and replacement of the Art Deco Building will not enhance or preserve the special character of the area as the design and materials are totally inappropriate. The future is not about replicating the past, it is about understanding it, working with it, challenging it and expressing all these issues in a confident urbanism for Scotland. This matters because places matter, because places are all about people. Application does not meet recommendations made in this Report. This entry was posted in LHNCC area, planning and tagged Edinburgh Council, Leith Walk, Planning, Stead's Place. Bookmark the permalink.